I first heard about Salt Therapy of Georgia from Groupon. I’m always up for trying new things, especially when it comes to new ways to relax, and I enjoy learning about natural and alternative health topics. 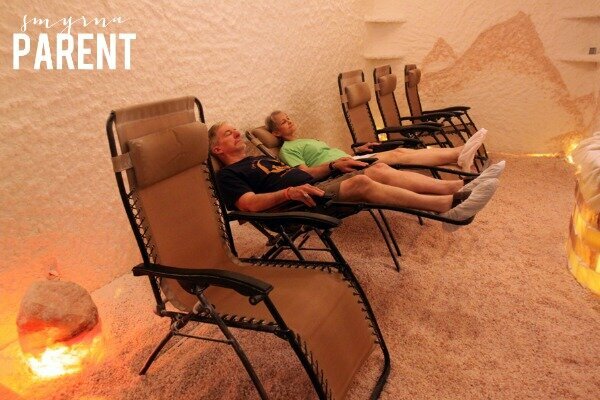 I love JeJu Korean Spa in Gwinnett, so I thought the salt therapy room might be similar to their salt hut, minus the heat aspect. Either way, I figured it was worth a shot to find something comparable but much closer to my neck of the woods. While it wasn’t quite the same, it did have one very similar aspect, and that is that the room (or hut) is covered in salt! Before going in you are given a pair of shoe covers for your feet, and the option to grab a blanket. There is no food, drinks, talking, or electronic devices allowed in the room. There is a row of six chairs that recline, and you’ll go in and take a seat. In a minute, the lights will dim and relaxing “meditation” music will be playing, as salt air gets pumped into the room. The temperature is a typical “room temp”, but tends to feel a little cooler as your body starts to relax. The floor is covered in large pebble-like salt. The walls are also covered in salt, a finer grain, in two different colors creating a “painted” depiction of mountains. There are also various salt lamps throughout the room, and a fine dusting of salt on the chairs. Sessions are started at the top of every hour, and reservations are recommended. You can either choose to read during the 45-minute session, to relax and meditate, or to simply take a nap. Once the session is over, the lights brighten up and you’ll know it’s time to exit the room. Like the adults room, you will be given shoe covers to go over your shoes or bare feet. For smaller children where the covers might not fit, they can go barefoot into the therapy room. The children’s room is set up different from the adults however. The floor is made of a fine-grain salt, similar to sand. 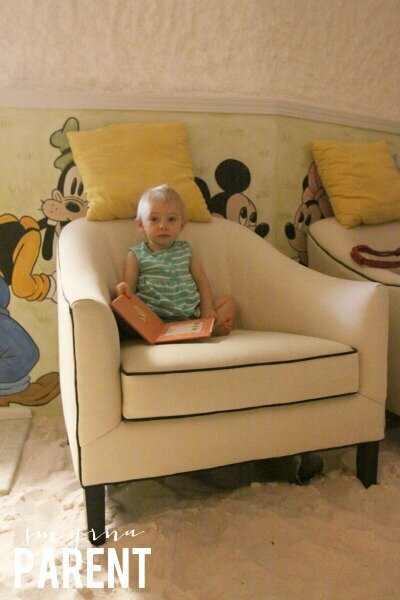 The walls are painted with fun loving characters, and there is a small child-sized table and chairs in the corner. There are also two adult chairs along the back wall, and a bookcase with books, puzzles, and toys in it (trucks, beach pails and shovels). The kids are free to play during their session, and the parents can either relax in a chair or play with them. Same rules apply as the adult room in regards to no food and beverages allowed, but talking quietly is definitely ok in this room. 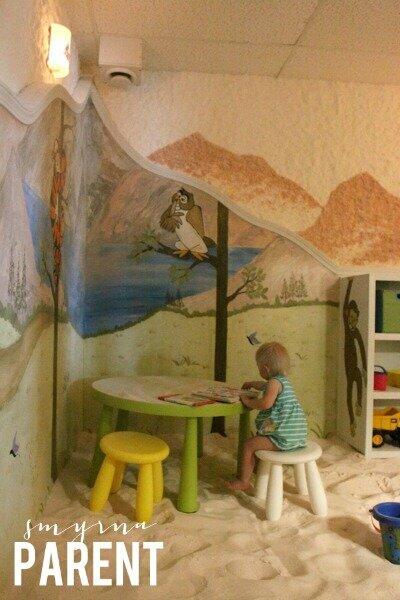 The children’s room is for any age up to 18, and children 16 and under must be accompanied by an adult. I went twice, once by myself, and once with my daughter who was around 18 months. I had a very relaxing time in the adult room, and chose not to do anything but relax and think during my session. I could have definitely stayed in there longer but left feeling refreshed. The session with my daughter was an interesting experience for her. She wasn’t too sure about the cool sand-like salt on her feet when we first went in there, but had a fun time playing with the puzzles and books at the table. We were the only ones in the kids room, so it was basically a quiet and relaxing play session for her, with the added sensory elements for her to experience. She finally accepted the fine-ground salt floor right before the session was over. And due to the size and layout of the kids room, I could slightly taste the salt on my lips that was being pumped into the air throughout the session, as I’m sure my daughter did as well (I did not notice this in the adults room). The staff here is friendly and knowledgeable. The facilities are clean and inviting. The price for the adult room is decent ($30 a session), but the child’s price is a bit misleading. The website (and sign at the front counter) state that the child’s price is $5, which I thought was exceptional. But if your child is under 16 years old, you’ll have to pay the regular adult price + the child’s price, since you’ll be accompanying them into the room. Since I wasn’t able to relax in the children’s room like I was in the adult’s room, paying the regular adult price for me to go into a session for my child was a bit much. I can definitely see how it would be worth it if your child has respiratory issues, asthma, or something that you’re going there to treat, but for the family that is just looking for an immune boost or a new experience, the kids room might not be the best value. I would definitely recommend giving a session a try, and I will no doubt be back, especially come cold and flu season! For more information on Halotherapy and on Salt Therapy of Georgia, visit their website.